Amy Jo Johnson (born October 6, 1970) is an American actress, singer, songwriter, musician and gymnast, first starring as the original Pink Ranger Kimberly Ann Hart in Mighty Morphin Power Rangers. Aside from Power Rangers, she is also known for her roles in Felicity, The Division, Wildfire, and Flashpoint. She also starred in television films including Susie Q, Killing Mr. Griffin, Perfect Body, Sweetwater, and Magma: Volcanic Disaster. Johnson is one of very few Power Rangers alumni to continue her career as an actress. Johnson released her first song, Puddle Of Grace, when she was on Felicity. Since then, she has released a few solo albums. As a volunteer, she has participated as a tutor for refugee children through the International Rescue Committee's summer program in the Bronx and made trips to Bosnia as a volunteer with the Global Children’s Organization. For her role as Jules Callaghan on Flashpoint, Johnson was nominated for the 2009 Gemini Award for Best Performance by an Actress in a Continuing Leading Dramatic Role. 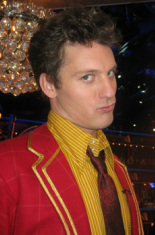 Tristan MacManus (born July 23, 1982) is an Irish dancer, best known for his appearances on Dancing with the Stars. Tristan MacManus began dancing in his hometown of Bray, County Wicklow, Ireland before moving on to compete around Europe, eventually winning numerous Juvenile, Junior and Amateur competitions. After appearing in Ella Enchanted, he performed in theatre productions throughout Ireland, most notably in Cork City Opera House and The Gaiety Theatre, including Bryan Flynn's production of Oliver! and Aladdin, among others. Next, he joined the UK tour of Simply Ballroom and, after a successful tour in London and Las Vegas, went on to Australia and America where he toured as a featured dancer with Burn The Floor and Floorplay. After numerous world tours and a year teaching Ballroom and Latin dancing in Boston, he returned to Europe to join the cast of Dirty Dancing as Dance Captain. He then went on to do a second stint on The West End stage in London. MacManus made his first appearance on the twelfth season of Dancing with the Stars as part of the "dance troupe," performing multiple dances during the results show. In the show's thirteenth season he returned along with fellow troupe member, Peta Murgatroyd, to compete as a contestant. Tristan's previous DWTSGame partners include: Fran Drescher (quarter-finalists), Ashley Judd, JK Rowling, Brittany Brannon (semi-finalists), Sigourney Weaver, Helena Bonham Carter, and Joannie Rochette (runners-up).